You also have the ability to add and modify equip types directly in the database in the Terms tab. However, one problem you might notice is that every actor will have those equip slots, even if they can’t use any of the equips that you’ve designed for those slots. Another problem is you can’t add multiple copies of the same slot to an actor: they can only have one of each. Want to wear two accessories? Can’t be done. This plugin solves that problem. It provides ways for you to customize your actors’ equip slots, allowing you to choose exactly which slots they will have in the game. Download the plugin and place it in the “plugins” folder in your project’s “js” folder. Then open your Plugin Manager (F10), double-click an empty row, and select the HIME_EquipSlotsCore plugin. First, if you are using this plugin, the default “Initial equipment” box will no longer be used. Instead, you will manage all actor equip slots using note-tags. Depending on your preferences. I would recommend writing out the full name so that it is clearer, but if you ever change your equip types names you will need to remember to update these note-tags. If you would like to add more equip slots, just add more note-tags. Want 3 weapons and 2 rings, assuming they are in the database? And when you go into the game, you’ll see those slots set up for your actor! Because the Initial Equipment box is no longer used, you will need to find another way to specify them. You may want to add or remove equip slots during the game. Where the ACTOR is a reference to a Game_Actor object, and the ETYPE is the name or ID of the equip slot you want to add. A random equip slot of that type will be removed. If the equip slot contains an item, the item will be un-equipped and returned to the inventory. If no such equip slot exists, nothing will happen. By default, all equips have one equip type. You can assign additional equip types using note-tags. With multiple equip types, you can put on the same equip in multiple slotsof your choice. You can assign as many equip types as you want. This plugin provides bare-bones equip slot functionality. The purpose is to be able to use it with *any* equip scene, whether it is the default scene or a custom scene. You can try to see if my plugin will be able to work with other equip menus. For example, if you would like to use Yanfly’s equip menu, but you would like to use my equip slot functionality, simply place my plugin under this. This plugin does not offer a way to handle “dual wield”, because you might not have a shield slot, and it doesn’t make sense to replace a different slot with a weapon slot. Please comment if you need dual wield and how your dual wield mechanics will work. I noticed your Plugin is not compatible with Equipment Variables v1.02​ from LadyBaskerville​. I looked all over the place to find a plugin that allows me to change a variable if you equip a certain Armor on your Actor. That plugin allows me to do that but it doesn’t work at all with your Equip Slot Core sadly. So my question is if there is any way to make these two compatible with each other. I would be grateful if you could help me with that problem. Hello, I’ve been trying for a while to give each character in RPG Maker MV to be able to equip 3 weapons, but I can’t seem to get the plug-in working in the way shown here. I’ve installed the plug-in and turned it on (no other plug-ins at the moment), and tried adding multiple ‘s for both Actors as well as Classes (the Weapon is already an Equip Type at this point), but the initial equipment settings aren’t overwritten. If I try making it so that there are three “Weapon” Types in the Types Tab, there will be three weapon slots and the first Weapon slot lets me choose a weapon, but the other “Weapon” slots just tell me to choose from Armors..
Not sure what I’ve done wrong at this point or could do in order to get this working. I wish I could use your script with yanfly plugins! This bug in the image appears while I try to equip my actors. You said there is no dual wield solution but for example if I set every weapon to be either “primary” as “secondary” (being secondary a armor type slot) wouldn’t it work? How about make shield Offhand? like shield can only be eq by offhand? but make it possible to eq a weapon too or is that impossible to code/script?.. Ok first nice work on this. It took a minute to get right being my first note tag plugin . Just wanted to see if there is a way to work in weapon tagging so if I have a sword equipped I then get a weapon slot, for say a power gem. But I want to be able to set each weapon with different amounts for their power ups. Can it be done or can it be worked out to do so. By the way I’m using mv and weapons don’t have a way to call scripts. As it turns out, you did make it so we can duel wield. If you want to allow duel wielding ala Final Fantasy 3, be sure your weapon and shield equip types don’t use spaces or symbols, and tell EVERY weapon and shield to use BOTH equip types. I even tested it with Yanfly’s ENTIRE library and it works. I think the dual wield problem refers to the trait that changes the shield slot into a second weapon slot. This plugin doesn’t have support for that trait. if you’re doing an intial equip aka an equip that an actor has, at the beginning of the game then you need an item code. However if you’re just adding or removing or edting slots, you don’t need an item code just the id of the equip slot or the name of the equip slot. Wait ignore the first comment. y= wn or an, where w means weapon and a means armor, the n is the id number of the weapon or armor. You can only use wn or wa as an initial equip. Hey Hime, I have a question. 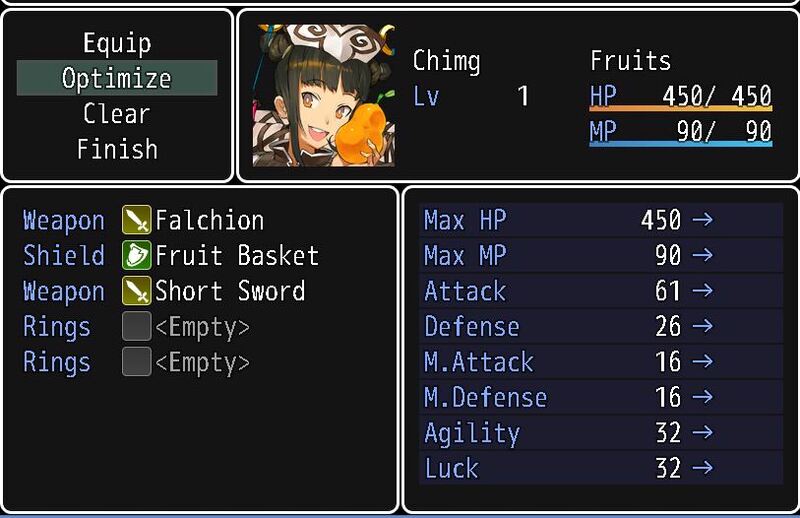 I’m using a lot of yanfly plugins and I also want to use this script, enemy equips, and weapon damage. Where should I put these three scripts so that they play well with the yanfly scripts? Because I know the order of scripts is important. Ahhh! This is exactly what I was looking for. Originally I was using Galv’s magic shards but that comes with it’s own set of issues (and is really better overall for something like a rune-based system), and then I was using a combination of Yanfly’s Equip Core and Equip Requirements (this plugin is not compatible with Equip Requirements, btw. Equip Core is fine though. This isn’t a request, I was just letting you know since Equip Requirements is an Equip Core extension). Hime, your plugin is exactly what I was looking for! I just need a little clarification on one point: You said in the comments that you could have an actor gain an equipment slot on level up, and then you cited your script call, $gameActors.actor(1).addEquipSlot(2). Are you suggesting that the level up event be done via a common event? Or is there another way to call this snippet on level up? It could be done in any way. The plugin just provides you with a script call to add or remove equip slots, and so it would be up to you to determine how you want the script call to be made. Specifically, the first three actors in my game don’t start with any equips for some reason. Disabling the Yanfly Item Core seems to fix this problem for some reason. The patch provided doesn’t do anything to solve this problem. Copying and pasting notetags from the fourth actor into the notetags of problematic actors don’t do anything. Yanfly’s plugin may have changed since the patch was written. Hi, trying to make dual wield work by having the weapon slot as a ‘main hand’ slot and a second ‘off hand’ slot that’s a new equipment type, along with a separate shield slot that seals the ‘off hand’ slot if filled through the item’s traits. The only trouble I’m having is getting it to recognize a weapon as an ‘off hand’ equip, even with an ” notetag it doesn’t take. Is there a way to do this? Are you using yanfly’s item core plugin? That plugin does not support note-tags for independent items. I am but even with it off it doesn’t work, and there’s an option to keep notetags with midgame note parsing with it on. I think it might be that it’s a weapon and not an armor? Can you post a screenshot of how the equip is note-tagged? You should remove the leading 0, and add in the / at the end. When I turn off either “YEP_ItemCore” or “HIME_EquipSlotCore” everything loads correctly. The problem is that I want to use both of these luggins for my game. Is there an alternative or a workaround? There should be a compatibility patch with yanfly's item core plugin in the download section. I’m such an idiot. Thank you and sorry. i meant to write shield but i’m assuming you could guess from the context. I managed to deal with dual wield in my own way. I made a “Dual-Wield” slot and gave it to my dual-wield characters. I also made all dual wield weapons a single weapon that does 2 attacks. It looks quite good too as you see 2 hits as opposed to just 1, like normal dual wield. Sounds interesting. How did you make the weapon do two attacks? I just made the “dual” weapon attack twice. Ok, I might have an idea about Dual Wield, it can play the attack animation for each Weapon slot that actor has and the damage dealt would be damage / number of weapon slots. Unfortunately, “atk” is based on the total atk of all weapons, so there would need to be a number of changes in order to separate equips during action execution. Is there a way to make a default amount of equip types for all actors? No, I think it would be better to just specify equip slots for each actor. I don’t know if is me but the patch for the yanfly item core doesn’t seem to work. I had try running only those three script but it still give me TypeError Undefine is not a function. Also, I made sure the patch is on the bottom too. Hiya! This plug-in does exactly what I need, but there is another feature I would like to be able to use. In my game each character can equip 1 weapon and additional accessories. Right now I can set it so some characters can only equip 1 accessory, others can equip 2, and so on. Is there a way to ADD these traits to a character, so that, say, after a certain point in the story they go from being able to equip 2 accessories to being able to equip 3, or even make it a level up trait so that when they hit level 20 they can now equip 3 instead of just two? Thanks again for the plug-in! I have updated the plugin so that you add and remove equip slots dynamically using script calls. The instructions have been updated to explain how this works. Which would give actor 2 an extra accessory slot. I need dual wield, and my dual wield will work so that you can use two weapons, but can also use a shield if not dual-wielding! OK so I have a major issue. Basically the plugin the only initially equipping the first actor with one thing, in this case its “Hull”. Do your actors have the traits required to equip those things? They may be automatically unequipped by the game. Yeah the actors have the traits to equip them. Are you able to equip them during the game normally? Do you have another equip plugin that might be conflicting with it? They can equip them in the game normally yeah. As for other equipment plugins I have Yanfly’s Equip Core. See if disabling yanfly’s equip plugin makes a difference. I tried disabling Yanfly’s Equip Core but that didn’t change anything. Then send it to me. Is there a way to apply these to classes that override the actor equipment, like a Fighter class that uses two weapon slots instead of one? 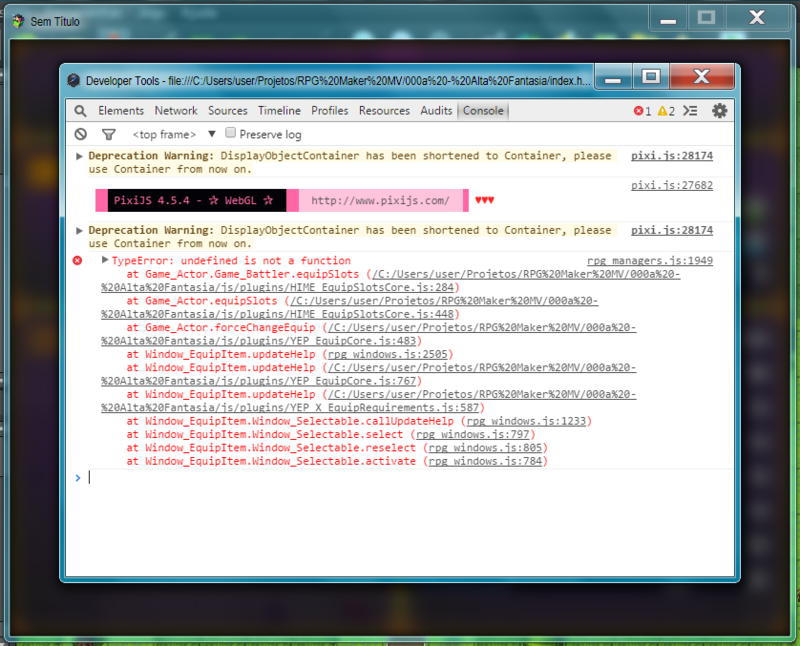 I’m using the YEP_ClassChangeCore plugin. I’m not sure how to handle all three cases in a good way. I really wanna use this plugin, but it doesn’t like Yanfly Battle Core or Yanfly Job Points, it happens whenever you go into the game. Its not important for me, since I use neither of these two plugins but they are very popular so others may have the problem. Oh ya, these comments don’t support block quote or things like that. I have updated my plugin to support Yanfly’s equip plugin. Thanks for the report. Dual wield shouldn’t do anything because the plugin changes the way slots are handled. I have not thought about how dual wield should work. Perhaps have users specify which slots will be replaced when dual wield is enabled. Do you have other equip related plugins installed?